For as long as I can remember, I have always been a bargain hunter. Few things feel better than finding that rare item on sale for as much as 50 to 75% off of its original price. I know without a doubt that I got this instinct from my Mother, because when I was growing up I can remember my Grandmother joking that she thought I would end up being a “Blue Light Special”. For those who are either not old enough, or not from the right region… K-Mart used to have a literal blue light attached to a cart that they would drive around the store, and for thirty minutes a specific item in the store would be at a significant discount. I remember my mother would always go to check out whatever these items were, sometimes whether or not we actually needed them. So to say that allure of finding a deal is ingrained in my very fiber is a very true statement. Thankfully my wife is much the same… so she gets it… and in truth we simply don’t like spending more money than we need to on anything. She however is always willing to carry it further than I am… and there comes a point where I am sick of dealing with something and am willing to spend any amount of money to be “done” with it. One of our favorite activities during the parts of the year when stores are changing out seasonal merchandise is to go clearance hunting. We live in Wal-mart country, and are roughly two hours away from the central office. This means at any time there are around thirty or forty Wal-mart stores within easy driving distance. The trick of Wal-mart is the odd quirk that every store is essentially self governed to a certain bit, and this extends to what they choose to put on clearance. So one store might have an item for full price, but a store ten minutes away might have it for 75% off depending on a whole bunch of factors. My Lego habit has been fed by the fact that I can pretty regularly find whatever sets I want on deep discount… so that $200 set becomes $60… or the $30 set becomes $10. So the question always becomes… is this item good enough of a deal, and there have been times I have passed something up only to kick myself later. For example when driving home from Pax South last year, I found Star Wars Lego AT-TE for $40, but ended up passing because it felt like we had already spent a silly amount of money that weekend. I’ve kicked myself since because that was originally like a $150 set, and really freaking awesome. So these instincts of bargain hunting and regret of the deals I have missed, carried with me into the digital world. As a result the Steam sale has been one of those forces of nature that I never can seem to resist. When I see that $60 game that I have always wanted to play… selling for only $5… it is really hard not to go ahead and pick it up and tuck it away for the day when I really get the desire to play it. The problem being… I like quite literally everyone else I know is doing this, and as a result we have hundreds of games as a steam backlog that we “really need to play”. Compound this with the fact that new games are constantly being released, it comes into a situation where there are just games that we own that we are quite likely never going to play. Over the last year I have tried really hard to resist the lure of the Steam Sale, but usually I end up picking up at least one “deal” that looks too good to pass up. Even though on some level the number of games that I have that I have not even installed… is a massive stress point for me. This past weekend for Thanksgiving there was predictably yet another Steam sale going on, with its own rock bottom prices on games. I hit the site a few times to see what was being sold, and oddly enough had zero desire to purchase anything. At this point we have done a bunch of renovations on the house, so there is definitely the desire to “spend no more money” going on, but I don’t think it was that. There were also plenty of games that looked interesting to me, so I don’t think it was simply the fact of not having anything I wanted. I think maybe it is just the fact that I have finally come to the realization that there is no limited quantity here, that I am racing to snap up before they sell out. In a physical store… they have a limited number of items on the shelf, and when those items are gone… especially when clearance is concerned… they are not getting any more. When you are selling a digital key to a digital game… there is absolutely no rarity going on there. They can sell keys a virtually unlimited number of times… and be able to keep ratcheting that price downwards towards infinity, each time catching a new batch of purchasers. A physical copy of Pokemon or Final Fantasy ends up gaining value, but a digital copy only serves to get cheaper. I think another thing that is finally sinking in… is that I can purchase a game at any point and don’t need to have it waiting in the wings for me to play. I have insanely fast internet right now, in fact I ran a test this morning for the purpose of this article and you can see it over on the right hand side there. There is not a game that is available on steam that I cannot literally download in less than thirty minutes. So it is not like I need to preload things to really be able to have fun… I can wait for the whim to strike me, purchase it in any of the many always on market places and be playing the game less than a half an hour later. This is vastly different from the chunk of my life where I literally had to drive an hour away to be able to find any of the games I wanted to play. There is a part of me that still attributed a value to having something on hand, rather than having to go out and acquire it…. since I still remember having to go from store to store looking for one of the last remaining copies of a new game. Now I purposefully shun physical copies of things for the simplicity of knowing I can pre-order moments before the release of a game and still get the full benefit. The other side effect is that there is quite literally always a sale going on somewhere. Between Steam, Origin, GOG, Greenman Gaming, Amazon, Humble Bundle… and countless other minor retailers there is quite literally always a sale going on for any game I could ever want to play. The only time this is not necessarily the case is for any game I might want to play on the Playstation 4. There I am very much still at the whim of a single game store, since once again I am not a huge fan of buying physical copies of games for the console. I greatly prefer the fact that thanks to my 2 Terabyte harddrive upgrade in it, I can have most everything I might want to play “on tap” and waiting on me to boot. All of these things honestly make the individual digital games worth less to me than they used to… and this is maybe going to be a problem that the industry will have to deal with. There was a time when I was willing to “snap up” a game for $20, and that degraded to $15… and then to $10… and now quite literally a AAA title has to be $5 or less for it to trigger that “buy now” instinct. I feel like I am simply becoming desensitized to the effect of the “Big Sale!” and now it seems simply easier to pay the price something is currently selling for rather than trying to stock pile it for later. This entire topic came up, because this recent steam sale seems to be the one that a good chunk of my friends also passed up. 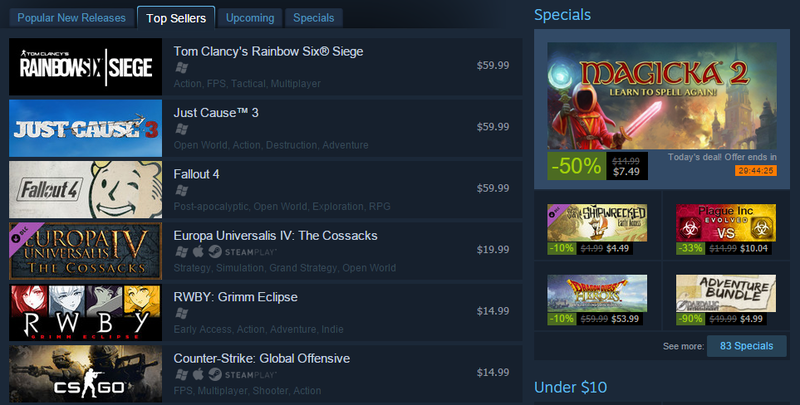 Has the magic of the Steam sale finally lost its magnetism? I’d be curious to hear some of your thoughts about this, because for me at least over the course of this last year…. the only “deals” that I have really snapped up are those coming from Humble Bundle or the PSN store. The Steam sale is not what it once was. This past year I have picked up very little in the Steam sales. Either already have everything I want or the prices never get good enough for me to pull the trigger. And these days one rarely has to pay full price even on release day. Maybe its just not as many games being released but the number of top shelf games in the Steam sale seems to have gone down a great deal as well. I don’t know if you have one, but most of us also have backlogs in Steam and other services. At some point, the allure of a new deal fades when you realize that you have 50 other deals already sitting in the pile that you haven’t gotten to yet. Also, the back catalog only has a finite number of great games in it. When the sales let you exhaust most of the cream of the crop, there’s only a relatively smaller number being added to it anymore. That leaves less for the sales to really entice people with.